Splashtop On-Demand Support (Splashtop SOS) is a popular solution used by MSPs, IT teams and support professionals to deliver on-demand, attended support. 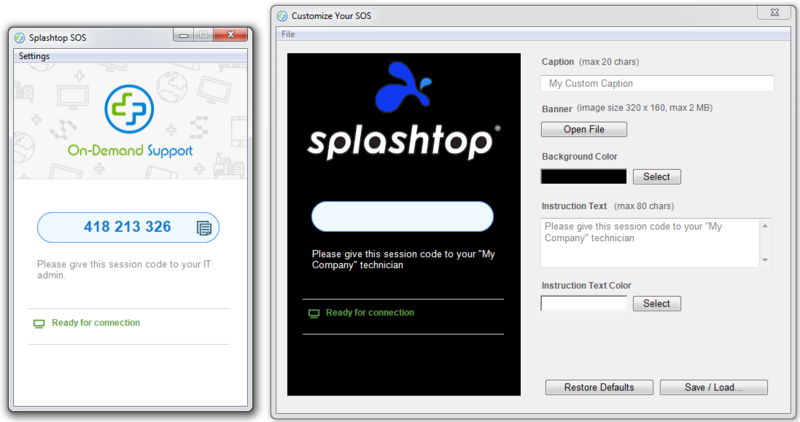 The standard attended support process with Splashtop SOS is pretty simple. Is there a way we can host the SOS app on our own site instead of referring users to the Splashtop web site to download it? Can we change the branding of the SOS app to show our own company name and logo instead of Splashtop SOS? Can I make it easier for my end-user to start a support session next time and not have to tell them to download from the Splashtop web site each time? The SOS app is updated regularly to add new features so you won’t want to host a static version of the actual files on your site. Instead, you can put hyperlinks to the Windows and Mac apps on your site that will always link to the latest versions of the apps on the cloud. Then just create a page on your site where you will direct the user and put those links on the page so they can download the apps. If you create a custom branded SOS app (instructions below) you host that custom app directly on your site. Now, instead of telling the user to go to sos.splashtop.com, you can point them to simple URL on your own site. Now you can customize the Splashtop app with your company’s logo, colors and text to provide a better, branded user experience for your end users. You can customize multiple aspects of the app including the caption (name of the app window), banner/logo, background color, instructions text, and text color (if you need to adjust for light text on a dark background or vice versa). Once you create your customized version of the app, you can make it available for download from your web site. Note that each time the SOS app is updated, you should apply your custom branding to the new version of the app, sign it, and make sure you are distributing the latest version of the app to your end users. Here’s a quick tip that can make it easier for your users to more easily start the SOS client app and give you a session code without having to point them to download the app from the Splashtop web site each time. The user has usually just downloaded the SOS app so on Windows it’s as easy as going into their Downloads folder and dragging the “SplashtopSOS.exe” file to the Windows desktop. That will create a desktop shortcut for it. If you can’t easily find the file, access the “Settings | Download Streamer” menu option in the Splashtop SOS app that is on your client’s computer and that will start a new download of the file that you should be able to easily locate. Then follow the steps above to create the desktop shortcut. 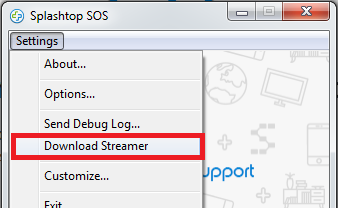 Download Streamer menu option in the SOS app on the end-user’s computer. In this article we’ve seen how to increase technician productivity and make it easier for your end-user support customers by offering SOS app download links from your own web site, custom branding the SOS app, and creating an SOS app shortcut on and end-user’s computer to make it quick and easy to start future support sessions. If you don’t have SOS yet or are using another on-demand, attended support solution, check out SOS now. If you already have Splashtop SOS, we hope you find these tips helpful.